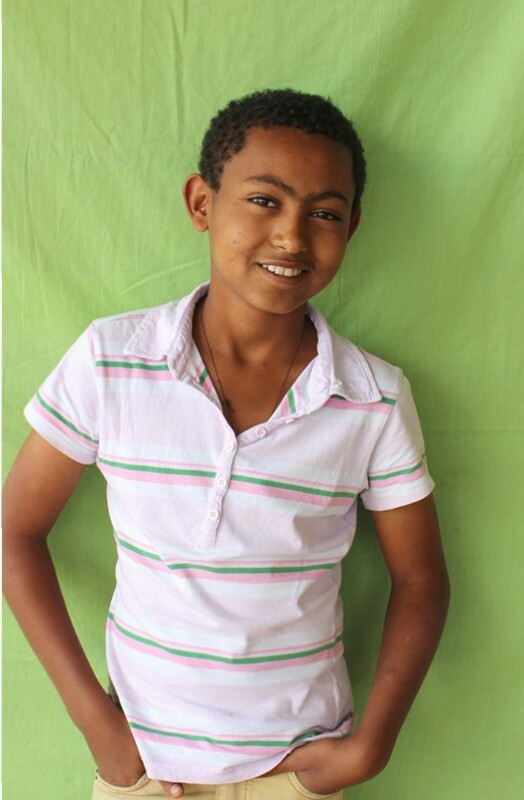 Bereket Tamirat is an inquisitive 13 year old who lives with his brother and grandmother. 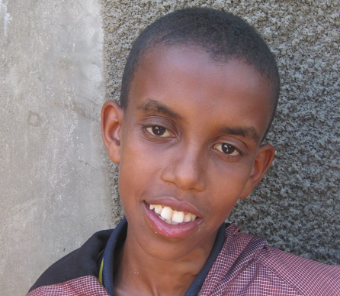 Bereket was raised by his mother, Hewan, who was always a hard working single mom. She provided for Bereket and his brother single handedly and to the best of her ability, even if it meant she went hungry or without shoes. Working as a day laborer doing whatever back breaking work was required, sometimes breaking up and carrying rocks for construction work, Hewan severely hurt her back. Her injury not only made her unable to work and provide for her boys but she had to go to a hospital in Addis to receive treatment. This has been a difficult situation for everyone because Hewan and her boys miss each other terribly and the care of the boys has fallen to Hewan’s mother. The boy’s grandmother does her best to provide for them through her husband’s military pension – which is around $16 USD a month – and by watching a child during the week while his mother works. Even so, no matter how she tries to stretch it, it is never enough. 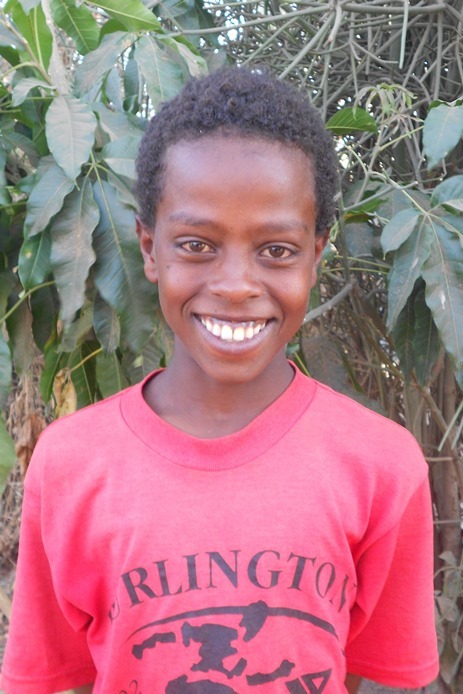 Bereket attends the BCI Academy in grade 7 and wants to be an engineer when he grows up. 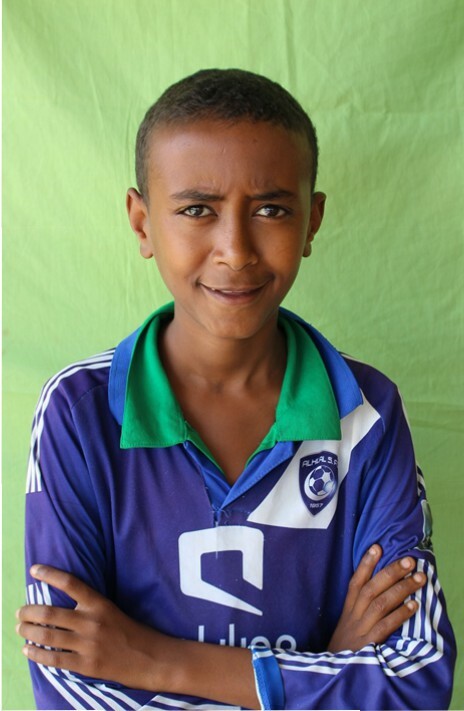 Like most boys, Bereket loves to play soccer with his best friend Yetemgeta and his favorite color is green. Berekets’s inquisitiveness and desire to know and understand things comes out when we asked him where he would travel to, if he could go anywhere in the world. Bereket told us he’d go to Italy because 111 years ago, the Italians tried to help colonize Ethiopia and he wants to meet them, to see their culture and to know their story. This curious young boy is still in need of a full $90/mo sponsorship. He is also in need of food, a blanket and a mattress as the entire sleeps on straw on the floor. 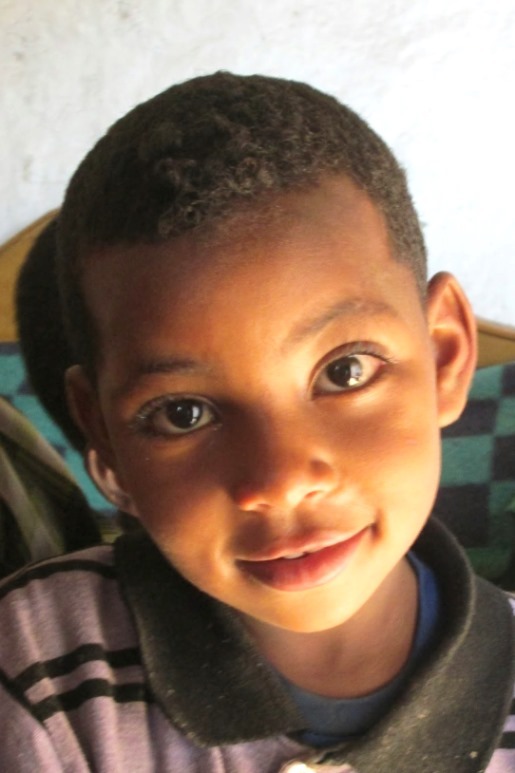 Can you help break the cycle of poverty and hunger for this eager young boy? 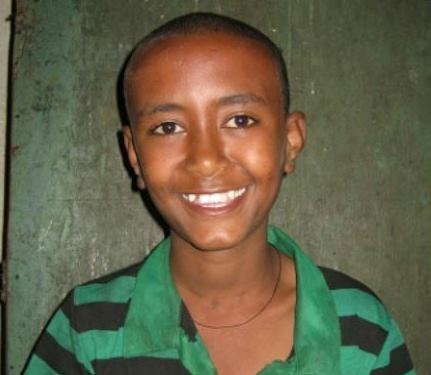 A sponsorship will provide Bereket two healthy, well balanced meals at the BCI Academy and ensure that he continues to receive a good education – which is the foundation of a good future! You can make a one-time donation or sign up for a sponsorship online, via phone or mail. Bemenet Olana is a smart, beautiful and selfless 11 year old who loves to dance. She lives with her mom and four siblings and with six people in the house, half of whom are boys, food often runs thin. Bemnet’s father is a former soldier who was badly injured by a bullet and is permanently disabled. 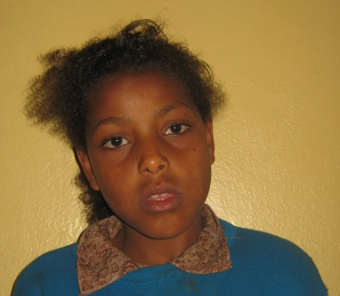 Her mother and her father met while he was in a military rehabilitation camp in Debre Zeyit. Her father has always lived close to his family in Debre Zeyit however when his camp moved to the capital city, Addis Ababa, he moved as well with a doctor’s recommendation. Bemenet is able to see her dad monthly but she still misses him terribly. Currently Bemenet’s family lives off of her father’s pension which is equivalent to $17 USD a month and her mother works as a daily laborer to supplement their income. There still isn’t enough money to keep food on the table and provide them with clothes, shoes and other necessities. Bemnet works hard at her schooling in grade six and it shows as she is in the top of her class. Her favorite subject is math and her least favorite is English. When she grows up, she wants to be an engineer. When she is not in school, Bemnet helps her family by washing dishes and doing other house work. She also studies and focuses on homework. She enjoys playing hide and seek with her friends and loves to run. When asked to describe herself, she said she loves to spend time with her family and friends, telling jokes and talking. She also said she loves school and it is an important part of her life. Bemnet loves to dance and thinks she’s pretty good at it too. Bemnet’s social worker says that Bemnet is very modest and that she likes to help other people. She is very caring and aware of others. If Bemnet is on a taxi bus and sees that an older person needs a seat, she will quickly move and give up her seat for them. Bemnet has been in the BCI program for over a year now but still has not been chosen for a sponsorship. She is currently in need of $90/mo in sponsorship and a new backpack for school. Would you be able to provide this quiet yet fun 11 year old with a sponsorship? Perhaps you can share her need with someone or make a one-time donation of love towards her support? Besufekad is a happy and precious four year old with a mental disorder. Until recently, Besufekad was unable to speak at all or do much for himself. Since his parents have been working with him, he is now able to self-feed and call out for his parents. Besufekad’s mental disorder is thought to be a form of autism but without a formal diagnosis, we can’t know for sure. His parents saved up the money to take him to a local doctor who told them that with proper care, his health could improve but they cannot afford to continue to take him to the doctor or provide that care. Besufekad is an only child living with his parents and is often seen running around wearing only a t-shirt. Both of Besufekad’s parents work as hard as hard as they can for their family but it’s never enough. His mother sells berbere, a spice, at the local market and his father works full time as a guard. Between the two of them, they make around 700 birr a month or $35 USD. Almost half of this, $15 USD, goes to pay their rent. While his parents are working during the day, Besufekad’s eight year old cousin is his primary care giver and other adults on their compound periodically check in on them. This family is urgently in need of clothes for Besufekad and a new mattress. Their small home contains one small mattress on the ground that Besufekad and his parents share. 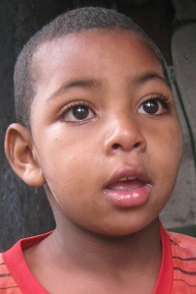 Would you consider sponsoring this precious little boy so that he can begin receiving grain and medical support? Perhaps you could make a one-time donation of love towards a new mattress or clothes? Is there someone you can share this need with? Tigist is an only child who lost both of her parents when she was just one years old. Luckily, Tigist’s aunt took her in and began raising Tigist as one of her own children. Tigist doesn’t remember her parents or their death, her only memories are of her new family and her six siblings. They were never well off but they didn’t go hungry, that is, until Tigist’s uncle fell ill. Since he has been sick, it is difficult for him to work and it has become impossible to provide for the family of nine. Tigist helps around the house by washing dishes and cleaning. She loves the color red and to play hide and seek. In the future Tigist wants to be a Doctor. Tigist is still in need of one $90/mo sponsorship or three $30/mo sponsorships to begin receiving support. 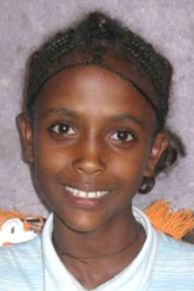 Once she is fully sponsored, Tigist can begin attending the BCI Academy, where she will receive 2 healthy meals a day. She will also be able to attend the other feeding programs and outreaches like VBS. Abel Sisay is a full orphan with an undiagnosed mental disorder that appears to be similar to autism. His parents passed away a while ago and his older siblings have taken him in. They have tried to support Abel but his disorder is an ongoing challenge as they have no knowledge or support to know how to help Abel. Abel is 14 years old and is still unable to speak. Because of his inability to verbally express himself, Abel expresses his feelings by yelling and/or hitting those around him. His siblings would like to take Abel to a doctor to get a diagnosis, to find out what they can do to help or teach Abel and to see if medicine will help. Unfortunately, his brother is the family’s sole source of income at just under $20 USD per month. They can’t afford food and household items, let alone to take Abel to a doctor or to get any help with understanding his disorder. Would you consider sponsoring Abel and lightening the load for his siblings, who graciously took him in? Perhaps you can make a one-time donation towards a doctor visit for Abel? Would you be willing to share this need with your friends and family? Nebeyu Shimeles is an artistic and intelligent 13 year old who lives with his mom and his aunt in a small compound with three other houses. His mother was living in Dukem taking care of a sick relative but when that relative passed, she had no choice but to move to Debre Zeyit where her sister offered to take her in. Nebeyu’s mother sells charcoal and firewood just outside their home or at the market areas to make ends meet. She does her best to provide but it is never enough. 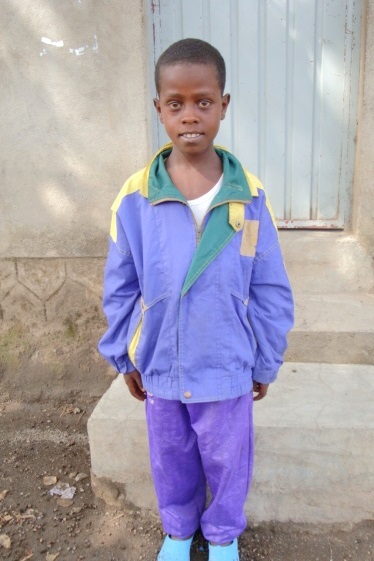 Despite the hard life he’s had, going hungry and without shoes or other necessary items, Nebeyu is a fun-loving young man although he is shy around new people. He is reserved and cautious and likes to know people before revealing himself but once he opens up to you, the fun begins! Nebeyu is artistic – he loves to write poetry and he loves his mom even more. You can see how very important she is to him and how much he appreciates her through his artistic expression of poetry, often reflecting his mother and her love. Nebeyu goes to BCI Academy and is in the 7th grade. Even at 12 years of age, he desires to be an engineer and prides himself in his math and physics classes. Thanks to BCI, Nebeyu now eats both breakfast and lunch at school, which helps him to be more focused and alert so he can concentrate on his studies. Nebeyu says he is very happy for the nutritious meals that enable him to do better in school because he believes school is very important. Would you consider investing in the life of this intelligent, determined young man? Nebeyu is still in need of $90/mo to remain in the BCI program. Receiving a sponsorship will enable him to continue receiving two healthy, well balanced meals a day and to continue his education at the BCI Academy. Would you reach out to Nebeyu and provide him with a sponsorship? Perhaps you are able to give a one-time gift of love? Nebeyu needs one $90/mo sponsorship OR three $30/mo sponsorships. You can make a onetime donation or sign up for a sponsorship online, via phone or mail. Biniam is a quiet, shy young man who has lived a hard life. He lost both of his parents when he was about 10 and out of 8 siblings (4 brothers, 4 sisters), only one of his sisters stepped in to take care of him. After 7 years, he still lives with his sister and plays the man of the house by hauling water since they don’t have running water in their home. His sister works to support them by selling barley flour and a barley drink. You can see how much Biniam loves and appreciates his sister for what she has done and continue to do for them. Unfortunately, despite her best efforts, his sister does not make enough to provide food, clothes and other necessities for them and they often go without. Biniam attends school at the Joshua Academy, a private school in Debre Zeyit. Right now he is in the 10th grade and next year, he will be attending the only preparatory school in Debre Zeyit, which is a great accomplishment. 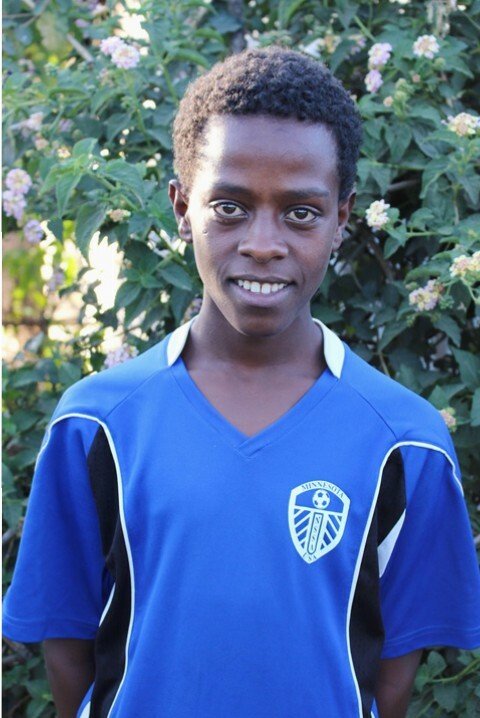 Biniam enjoys studying and playing soccer with his best friend Fokeriob. He also loves to swim. Biniam is in current need of two more sponsors to support him at $30/month. Would you be able to step in and help support this bright young man? Can you help Biniam towards a bright future? If you’re unable to commit to a monthly donation, perhaps you could provide a onetime donation of love for this orphaned boy and his sister, who so selflessly took him in?